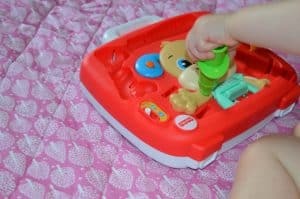 When I think of interactive educational toys for children I think of Fisher-Price. They make some lovely toys for children that enable them to learn new things in a fun way . 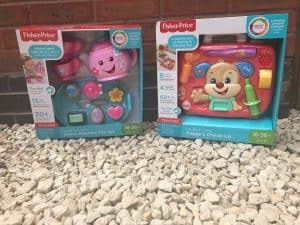 We have been very lucky and have been sent two Fisher price toys from the laugh and learn range to review. Ava is all about role play at the moment so home this came at the perfect time. She really enjoys to pretend to pour some tea into the tea cups and give them to me. The spout glowing different colours is a lovely feature. One which Ava really enjoys , she likes to try to tell me what colour the spout is . 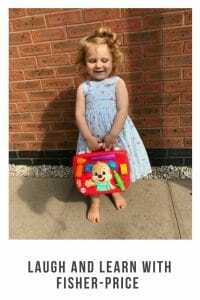 She’s getting lots better with her colours and having this at home has really encouraged her to keep on trying with learning her colour names. There is a little teabag shape near the top of the teapot that once pressed makes the teapot sing some songs. These songs include songs about sharing, shapes , manners and other little tunes. The spout also changes colours as the songs play. Also when you’re pouring your tea the tea-pot talks . It talks about shapes, numbers and also says thank you when you have poured a full cup. 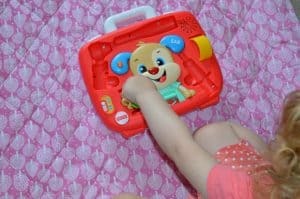 Like a lot of Fisher Price laugh and learn toys they have smart stages on them . You can change what stage your on really easily by sliding up and down . Number one is for younger children and number 3 is for older children . 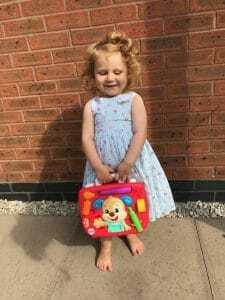 Depending upon what stage you have your tea set on the music and talking from the teapot will be different , in fact there are over 30 different songs to enjoy.However most of the time ours is on whatever stage Ava puts it on as it is easy to change between stages. But as this is aimed for children 18-36 months non of the bits are too much for Ava to understand. The teapot is lovely and I can see it will be a much-loved toy for many years to come. Way past the 36 months mark . It would however be good to have a volume control on it. I know most of the time children turn it up to the top volume anyway, but it would be nice to turn it down a little. As one very excited girl plus a talking tea-pot makes for a lot of noise. Normally when Alby is trying to have a nap. With the tea-pot you also get a tray which includes 5 different shape like cakes, 1 spoon and a sugar pot that cannot be removed from the try. 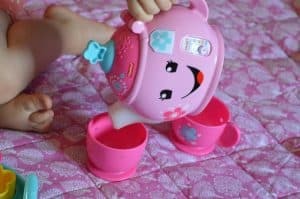 The tea-pot does talk about the different shapes and ask if you can find a certain one which I liked.As they are not your normal shapes so it gets children to think more and also learn some more shape names. 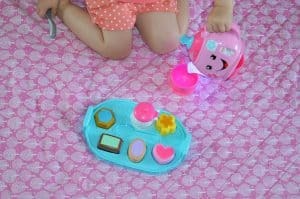 The tray makes a great addition to the tea-pot as it really got Ava to role play more. She pretends to serve me cakes and uses language like more. She also enjoys pretending to get the sugar out of the sugar bowl and mix it into her cups of tea. Overall I think this is such a great toy for children. It enables children to learn a wide range of thing. From number to shapes and more importantly reminds them about using their manners. Role play is such a great way for children to learn. I can see already Ava has started to really take in what the songs are on about. She is using more colour names in general conversation. Ava is also just using a wider range of vocabulary that she’s learnt through role play with both me and Alby. She loves to make him cups of tea and giggles when he tries to put it to his mouth to drink or maybe just chew it. After all he is still a baby. Ava is a lover of both animals and also playing doctors and nurses at the moment so I knew this was also going to be a big hit. The puppy check-Up kit has four removable play pieces these are a otoscope,bandage,thermometer and syringe. There are 8 match and learn points . These have corresponding colours to the instruments on the set. So children know what instrument is meant to be used in what place. I will be honest Ava just uses what ever tool she has closest to her to check the puppy. This though will be something she will start to understand more as she gets older. The pieces easily snap into place which is great for storage. This makes sure you don’t lose any pieces which is great. Especially when where tidying up I get Ava to pop all the pieces back into place. So we know we have them all there ready for the next time we want to play with it. The play pieces also aid role play away from the actual check-Up kit itself. Ava likes to use them on us to see if were okay. Here favourite one at the moment is the syringe she likes to give us medicine and tell us were all better. 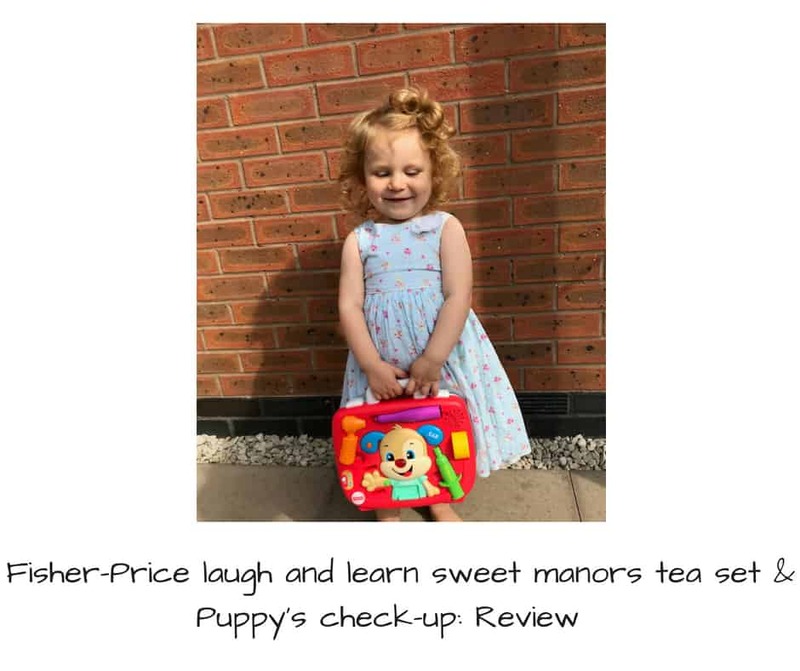 Like the Sweet manors tea set the Puppy check-Up kit also has 60+ sounds, tunes and phrases. Which Ava loves to sing along to. She also likes the fact that the puppy’s nose lights up and that you can lift his t-shirt which then shows his heart and ribs. This also has smart stages on so you can change it for the age of the child that’s playing with it. The puppy Check-Up kit does come with a volume control on the back of the kit. Which is great as you can turn the volume down a little. 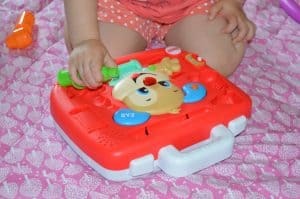 Any parent will tell you a volume control is a must when it comes to interactive toys. Not only does the puppy Check-Up kit teach your children English words. The one we have also teaches French words. I’m all up for the kids learning words in a different languages. After all its meant to be easier to learn an additional language if you do it as a child. I have seen online you can get it with different additional language options. So this may be something to look at if your after a specific language. I also like the fact that it comes with a carry handle. Ava is that child who likes to take her toys with her where ever she goes. Normally she has armfuls of different things. This having a handle on meant she was able to carry it easily. So she could take her puppy Check-Up where ever she wanted to. The Puppy’s check up kit is the perfect interactive toy for children ages 18-36 months and older. Again this can grow with your child thanks to the smart stages. 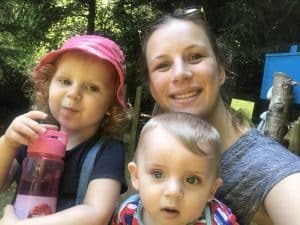 I really like the fact that it covers such a wide range of learning from body parts to healthy habits and they can also learn words in different languages. The parts are easily removed and put back again so you can keep them safe until you next want to play with them. The songs and tunes are also really catchy and get Ava’s attention. I have caught her on a few occasions singing them even when she isn’t playing with it. Overall I’m really impressed with these two products from the laugh and learn range. I didn’t realise how much they could possibly learn from using interactive toys like this. They really do make learning lots of fun. Both of these toys have now made Ava want to do role play more and more. Which is so lovely to watch even if she does mimic things that I do.